Did the long ball tactic really ruin English football? In the glorious game of football many things are forgiven—cheating, biting, lying, spitting—but there’s one thing that’s inexcusable. One thing so wretched and sickening it deserves no place in the game we all know and love. That one thing, the cardinal sin, is called the long ball. Next year marks the 50th year of hurt for the weathered and beaten English faithful. 50 years since Geoff Hurst belted the ball against the bar and allegedly across the West German line. 50 years without a trophy and what’s to blame? That despicable long ball. For years England fans were forced to watch their side humiliated by tactically superior opposition who got the ball down and played it on the ground. England stood mesmerized as their refined and modern ways perplexed our barbaric, Dark Age tactics. The stigmatization of the long ball in England is so strong that it’s not only blamed for our international failures, it’s also blamed for our inability to produce technically gifted players and even cost Tony Pulis his job at Stoke. Thankfully, in the last decade England recognized the error of their ways and transformed their repulsive football into a more attractive, possession-orientated style. The problematic tactic was discarded and across the nation, the people flocked to the streets in a fit of joy as England passed their way to a 4th placed finish in Group D at the 2014 World Cup. So, was the problem the long ball, or was the problem England? The issue wasn’t the ineptitude of the tactic; the issue was our own ineptitude to execute the tactic. Prompted by an expanding foreign influence and strategic revolutionaries like Pep Guardiola, the degree of detail and analysis regarding tactics has reached an unprecedented level in England. 20 years ago, if you heard an English football fan utter the phrase “3-5-2”, they would’ve been referring to how many pints they had at home, in the pub, and at half time. 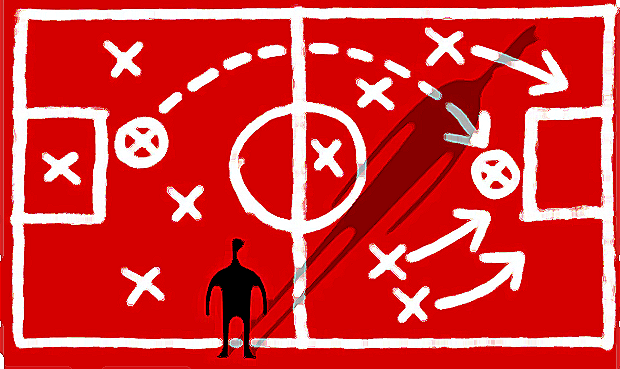 The English game has played catch-up in terms of its tactical awareness. From strong-arm hooligans to armchair tacticians, instead of debating whose centre forward would win in a fistfight, fans now debate the value of false 9’s and inverted full-backs. In the land where managers once scribbled their team sheet on the back of a cigarette packet, teams now employ staff tasked exclusively with analyzing the match and providing each player with an individual video report. Naturally, the standard of the English game has drastically improved as a result of this newfound tactical awareness. We are in an age that strongly favors possession orientated styles, thus they are the beneficiaries of such a phenomenon, but what if we treated them like we treated the long ball? When England utilized a long ball tactic, the level of tactical instruction from the manager bordered somewhere between “don’t f*ck about with it back there” and “welly it up to the big lad”. We became lazy with the long ball and didn’t analyze it with the amount of detail required for a tactic to work successfully. Can you imagine how well a possession orientated tactic would work if the manager simply said “make lots of passes”? On Boxing Day I attended a Varnamara Conference match and the pattern of the game was a microcosm of England’s downfall since that glorious day in ’66; it was a lesson in how not to play direct football. I may as well have attended a ping-pong match, as the centre backs continually and purposelessly launched the ball from end to end, as if the ball was a live grenade and each defensive third was a trench. My neck was harmed more than the opposition’s defense. Adding to the issue, the forwards were more motionless than a deer in headlights, the wingers showed no intent to stretch the opposition and receive a pass out wide or in behind the full-backs, but who could blame them, as the centre midfielders seemed genuinely perplexed by the idea of a diagonal pass. These weren’t teams who had been meticulously coached on the various movements and patters that make a more direct tactic successful, these were teams who, like most in England for more than a half century, lacked even a shred of tactical awareness. A direct tactic utilized correctly requires precision passing from the back, intelligent and coordinated movement up front, blood-thirsty wingers ready to torment the full-backs, and centre midfielders who can thread Hollywood balls through the eye of a needle. When coached properly, a direct tactic resembles Manchester United in the late 90’s; exciting, incisive, and fast tempo football. Dwight Yorke and Andy Cole seamlessly interchanging like well-oiled machinery, David Beckham and Ryan Giggs flying down the wing and whipping in crosses, and Roy Keane and Paul Scholes spraying 60 yard passes with a nonchalant ease. Yet no one refers to United’s style in the 90’s as long ball. Why? When a tactic is executed to perfection, regardless of what tactic it is, the adjectives change. Hoof morphs into ping, parking the bus morphs into incisive on the break, and boring sideways passes morph into virtuoso passing moves. In the court of public opinion, the long ball is charged with England’s tendency to develop the bigger and stronger players instead of the smaller, more technical players. However, that tendency didn’t pragmatically enhance our playing style, it hampered it. While in certain positions the long ball requires players who can play with their back to goal or win a header, it also requires players who can play that 60 yard pass, precisely whip in the cross, and beat the defender one on one. A more direct style encourages coaches to develop well-rounded players; players with both technique and physique. As a nation, wouldn’t you want to develop complete footballers? In a vicious cycle, producing technically inept players hampered the long ball as much as it hampered the English game as a whole. If the centre back can’t hit the broad side of a barn, the ping turns into a hoof. If the striker doesn’t have the positional intelligence to know when to exploit the space in behind the defense and when to drop off into the channel, that hoof doesn’t even have a viable target. If the centre midfielders won’t play the pass to release the wingers and switch the play, the passing patterns become linear and predictable. If you play the long ball like we have, it is a purposeless and unintelligent tactic. Tactically speaking, England was a child until a little over a decade ago. If you give a child the keys to your car, and he crashes it, is that the car’s fault? A Brit living stateside, Harry is a student, coach, and Grimsby Town supporter. The latter, he says, is by far the hardest.